I have been thought that it is not easy to grasp the issue that occurring in the industrial chain so far. Therefore I added information and tried improving it. I think that it is highly effective to visually display it, but I think that it is better to wait for integration from Standard for large modification of GUI. Also, they will be greatly affected when changing the city growth system. Therefore, I aimed for easy renovation at present. However, there is a part that changed code to display necessary information. Please check this point carefully. I moved the status bar under the view window to the upper right left of the dialog. It is similar to the station information window, thus the player will soon understand this. It is judged by checking the existence / nonexistence of connection, operating status, stock quantity of input for each sector, inventory quantity of output. A level is set for the alert, and an icon corresponding to it is displayed. The numbers are for sorting on the Industry list. When the sort mode is status, they are sorted in order of good or bad status. staff_shortage is warned only at the staffing bar and the status bar's orchid colored frame. It is necessary to prepare short translated text to be displayed there. 0 to 4 do not display alert messages. These are not so problematic. As I am not an English speaker, text advice will help. Since extended has different range of freight and other station attributes, I changed it to make a judgment based on whether or not it is connected to the freight station. Until now it was judged as active even if it was connected with a passenger only station. The relationship with the player's workflow is as follows. 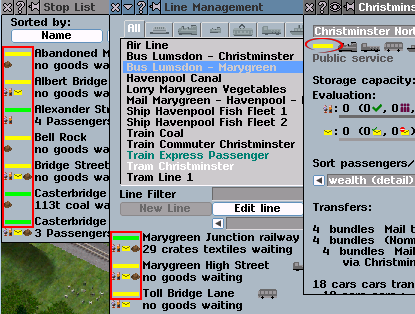 Since industries are not connected at the beginning, you can see that all industries except marine resources are displayed in gray. First of all, the player creates a connection between the industry and the station. When the station is installed and connected, the primary industry will be dark green, otherwise the yellow will be. 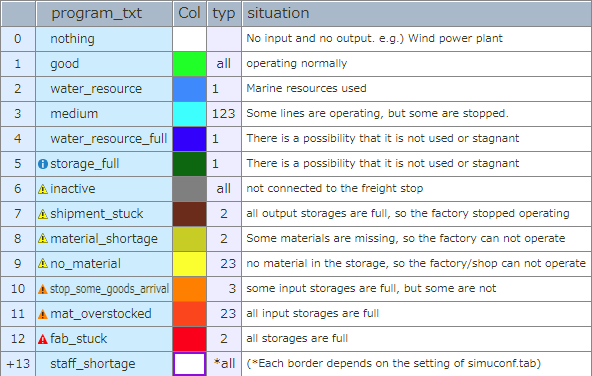 Dark green means that it is full of materials, yellow means that the material is empty. The player aims to become green by connecting these. If it keeps going smoothly it will keep green, but when it stops flowing it turns into a color warning it. Dark color means that you have to bring out more. Deep blue, dark green, and dark brown. Yellow means that it does not have enough materials and goods, then it is recommended that you bring it to there. Red and orange means that the storage is full and transportation trouble is occurring. The bar under the Around view window has been changed to an indicator showing the stuffing fulfillment rate. This image shows how the staff fulfillment rate gradually declines. The zone where the productivity decreases is represented by yellow. Although this is a function existing from the original, the player can set different borders depending on the setting, rural industry, consumer industry, and others in simuconf.tab. The default is 0, 66, 80. I made it visible visually. When it falls below the border, the color of the bar changes to orchid. In this state it means that productivity is decreasing. What is different from the previous one is you can see to what extent productivity is declining nearly. At present, I thought that priority was given to the "staff shortage", therefore other issues held by industrial buildings were easily hidden. Although I could not think of a good icon design, since we already used icons for boost display, I thought it will be a problem to display bad status together. Therefore I added a orchid frame to the status bar. I should hear thoughts from everyone about how easy this is to be understood. Most industrial buildings have their own Mail Demand, but it was not displayed so far. This display is the same as the city building information window, but please note that there is another demand to be used for boost. The value can be confirmed only on the chart. Instead of displaying staff shortage so far, it will display some alert status. Is it all black or icon color better? Since the flow of passengers in the Extend is bi-directional, the arrival and departure of the factory which can not be the starting point shows similar data. That is, arriving passengers will surely return after they have finished their stay. There is a deviation due to time lag there, but the total number is the same. Therefore it is not very meaningful to display both data. So I did consolidate data to display. As a result, all events are aligned in rows and items in columns. Note: The function and numerical value of boost currently contend with the function of standard and it is strange, but I guess they may be modified by newly city growth system. 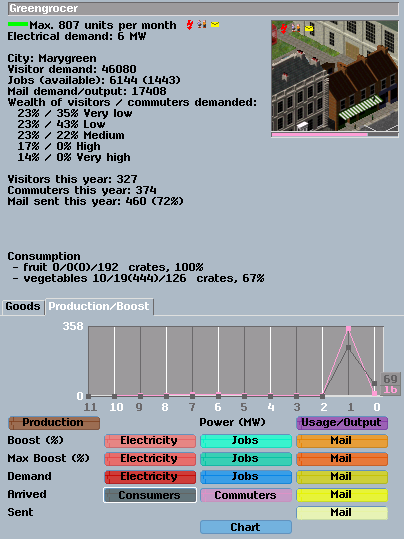 Along with consolidation of items, I changed the color based on the electricity icon and chart of city info window. - Chart label name of "Passengers" changed to "Commuters" and "Jobs"
It originally counted only commuters and added a new item "Consumer" and accordingly I changed it to clarify the distinction. This counts only passenger that visited for consumption, not visiting or commuting. This chart button is displayed only in end consumer industry. Internally it is distinguished in this way and sort list by this order. Note: Currently, there is no function to display sector information. Adjust the position of the arrow button. Currently it overlapped with the left frame. Some bugs and issues are fixed by this patch. 1) The condition displayed by Consumer industry as Staff shortage was incorrect. 2) Staff shortage was displayed regardless of the setting of rural_industries_no_staff_shortage. NOTE: This bug fix is not included in this patch. Please incorporate each. There are also some unresolved bugs reported to other threads. This patch places importance on improving display, not system improvement. It should be reviewed extensively in improving the city's growth system. However, as the factory status has been subdivided, it affects the factory's upgrade probability calculation. Temporary values are put in the calculation part of upgrade_chance_percent of void fabrik_t::new_month() of simfab.cc, so please review this before incorporating. "Demand" in the factory chart represents boost's demand, which is different from the actual demand. And this request value is not displayed in Mail demand / output:. Should this be dealt with? I still need to fix the details. I think it can integrate some functions. The patch will surely be better according to your advice and feedback. Please tell me your thoughts. I hope this patch will help your game play. This looks at first glance very interesting. My time is very limited this week, and what Simutrans time that I have I wish to spend prioritising the critical online bug, but some brief thoughts at this stage. First of all, would you be able to write an amended help text to go with this? It might be confusing for players for the help text associated with the factory information window not to give the explanation of the full range of colours. Secondly, I do like the coloured alerts with the graphics: this is a good style, and consistent with the style of some of your other patches, which is also good. 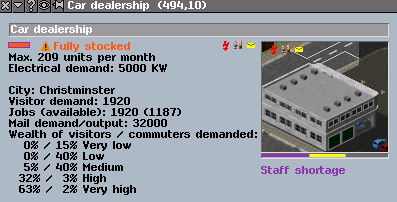 Thirdly, I very much like the idea of the staffing level bar. Fourthly, in relation to the boost demand, I suspect that the operation of the boost system will be reconsidered in due course when the town growth comes to be rewritten, as this is potentially anomalous. It may well therefore be worthwhile not having the separate boost demand represented in the graph as "demand", but having this refer to the more ordinary type of demand. Thank you again for your work on this - it is much appreciated. Very good ideas here, Ranran. many thanks! @James - Thank you for taking the time out to help me. would you be able to write an amended help text to go with this? It might be confusing for players for the help text associated with the factory information window not to give the explanation of the full range of colours. Indeed, update of in-game help text is necessary. Accordingly, I wrote a draft text. - <em>Sector</em> orders by economic sectors. - <em>Purple frame:</em> the production rate is declining due to the staff shortage. <em>Tip:</em> The minimum required staffing percentage for each industry type can be set in simuconf.tab. I am not a native English speaker so I (or Google translator) can not make accurate English sentences. Therefore it is necessary to decipher it and proofread it. I think that the intention will probably be transmitted, so please correct it to the correct expression. Any native English speaker will be able to help with this. Questions and suggestions for improvements are also welcome. Thanks. I believe this function is extremely useful in network play. This will help you to optimize your freight transport network in multiplayer game. - Public stops are considered to be included in own network. - Since ocean resources are handled as a dock, they are considered to be included in own network as well. Proofreading English text on this will help me. Thanks. Thank you for this. I am looking into this again now, although I do not have time this evening for a detailed review. This does look to be very interesting and worthwhile. May I ask whether you have made the modifications to the boost graph yet? One thing that I do query is the placement of the staffing graph. It is not immediately apparent that the bar underneath the viewport refers specifically to staff. The bar under the viewport in other dialogues (e.g. for convoys) refers to the status, and it seems inconsistent to have something relating specifically to staffing here. I suspect that this may confuse players. May I suggest that the status bar be restored to its original position and the staffing graph go next to the staffing text so that it is immediately apparent to players without having to look this up in the help files what this bar means? Also, one minor point - I believe that "Overstocked" should be "Fully stocked": "Overstocked" suggests that the industry is somehow in excess of capacity, rather than simply at maximum capacity. Also, I wonder whether it might be a good idea to have a status symbol/text for when an industry is operating healthily as well as when something is wrong, as players are likely to find it helpful to have some clear positive reinforcement when things are going well: this is also more consistent UI behaviour. Thank you again for your work on this: this is most worthwhile. Thank you for the clarification. Incidentally, it would be helpful to have feedback from anyone else as to the issue of the placement of the staffing bar as discussed in the previous post. 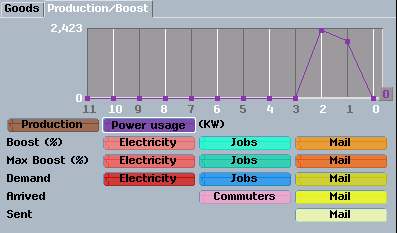 1) The display unit of power other than power plants has been changed from MW to KW. Because many industries have 0 MW of demand. It is supplied 0 MW power, and it gets a boost effect. The past chart always shows 0, so nothing can be read from the power chart. Even large modern factories have only single digit power demand. So it's ambiguous. - Since electricity and power demand/output are closely related, they moved to the same column. - The usage or output is now clearly displayed. The new status bar shows the staff shortage by the color of the frame. So I think not suitable under the viewport. The purpose of this frame is to prevent staff shortages from hiding other issues. 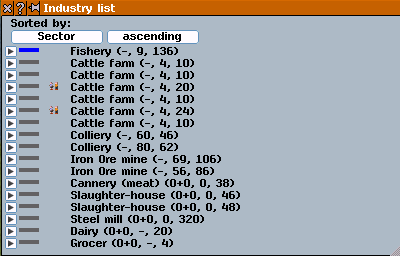 Since this is also used in the industry list, it is identical to the display of the industry list. It is easier for players to understand if the size and shape are the same. And IMHO, I think that space under the viewport is too wide to show status in a single color. I guess that it was made when there was only 64-size pakset. The commonality of the display can also be said in the relation between station information and the station list. The space under the viewport was not enough space for a 64-size pakset to display alert message. And I thought it would be better to be close to the status bar. So I moved the alert message to the side of the "new" status bar. The alert will be displayed at that place also in the convoy information dialog. I think this is the only convoy information. I don't think the status bar under the convoy information viewport is in common with other windows and it's not consistent with itself. Normal status displays black instead of green. Therefore, I thought that the factory status bar is close to the station status bar. The status bar under the convoy info view - this is an element of the extended original, but rudely speaking, I think that few people understand what this means. Because this is not working properly but no one reports it. Normal status displays in black, and "stuck" and "out of range" also display in black. IMO, it is not a good idea to unify operation information and revenue information. As a result, the color information on convoy is largely inconsistent between the information displays. It is the position of the staffing bar, it was originally displayed here to warn the staff shortage. I added tooltip help here, as this is now dedicated to staff shortages. This should allow to add help on the meaning of this bar. This tooltip help will also be displayed when there is no staff shortage alert message, but you need to mouse over the alert message position instead of the bar. Thank you very much for this. I have now tested and incorporated this. I take the point about the convoy window being the one that is not consistent, and I see the utility in having the long bar to indicate the staffing level. This is a definite improvement on the existing system and does make the industry status much clearer. There may be something to be said for doing the same for the convoy window, too, in due course. I'm sorry, I did additional work last night, so I have to say there is one unreported change. I thought to make the displayed data a bit more useful with reference to Jando's report. Primary industry is to display maximum monthly production volume, not in the form of% whose meaning is not clear. Please check it. Thank you for that: I have now checked this. This is a helpful change.